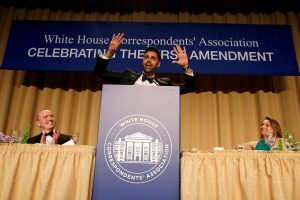 WASHINGTON — Prominent Washington journalists, if not Hollywood stars, celebrated the First Amendment during the annual White House Correspondents’ Dinner, an event that lacked the glitter of past years because of the absence of the president of the United States. The official WHCA dinner began in 1921. In recent decades, the event offered Washington’s press corps an opportunity to wear black tie and stunning gowns while mixing with celebrity guests. Most people trace that development to 1987, when Baltimore Sun reporter Michael Kelly brought Fawn Hall, the secretary at the center of the Iran-Contra affair. Bee’s taped show, a tongue-in-cheek tribute to American news organizations, featured actor Will Ferrell and other guests roasting Trump and his allies. It singled out the Committee to Protect Journalists, the nonprofit group that will receive proceeds from the broadcast. — Aldo Beckman Memorial Award winner: Greg Jaffe of The Washington Post for stories on President Barack Obama’s speeches and policies that contrasted the realities of 2016 with the hopes of 2008. — Merriman Smith Award winner for outstanding White House coverage under deadline: Edward-Isaac Dovere of Politico for his coverage of the historic meeting between Obama and Cuban President Raul Castro. — Edgar A. Poe Award winner: David Fahrenthold of The Washington Post for stories on Donald Trump’s philanthropic claims.